If you would like to nominate someone for the Adolph DeGrauwe Legacy Award, submit your nomination letter to Board President Chris Hartowicz at Chris.Hartowicz@cavaliers.org or by clicking on the button below to submit. Nominations are due by 05/01/2019. On Saturday, June 30, The Cavaliers held the fourth annual Ensuring Our Future Benefit to celebrate 2018, the organization's 70th Anniversary Year. 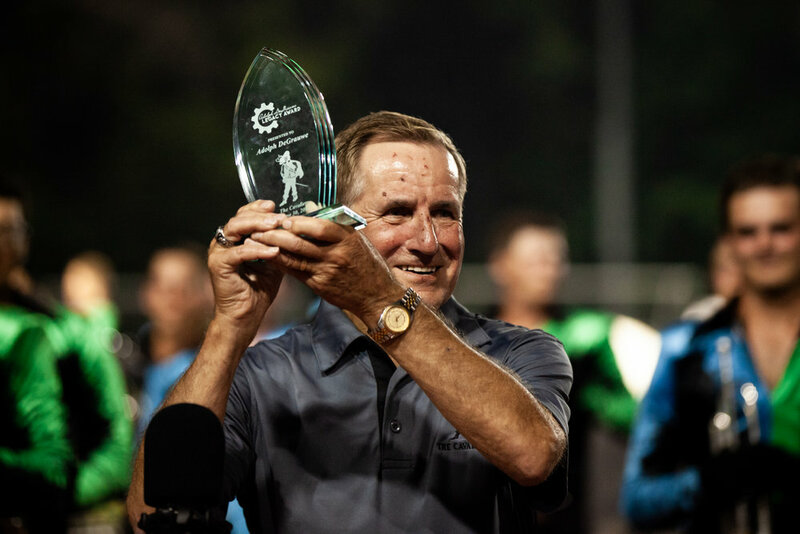 As a special portion of the event, The Cavaliers unveiled the newly established Adolph DeGrauwe Legacy Award as tribute to the man who has impacted generations of Cavaliers and who has set the standard of servant leadership. Adolph DeGrauwe started his drum corps career marching with the Ardens Drum and Bugle Corps in Chicago at the age of 11. He then joined The Cavaliers in 1955, marching through his age-out in 1962. DeGrauwe went on to serve as director of the Cavalier Cadets in 1971 until 1979 when he took over as director for the "A" corps. From 1979 to 1991, Adolph helped lead The Cavaliers' resurgence back into the upper echelon of drum corps. In 1991, Adolph stepped down as director, taking over the transportation department and serving as executive vice president on the Board of Directors, as position he held through 2008. Adolph then took over as president in 2009 and returned as corps director from 2010 to 2014. As a deeply respected mainstay in the drum corps activity, Adolph was inducted into the Drum Corps International Hall of Fame in 2000. The Adolph DeGrauwe Legacy Award recognizes a life-time of service, dedication, and servant leadership to advance The Cavaliers' organization forward. This special award takes into account one's lasting impact on others to bring life to, and to build on, founder Don Warren's vision from the 1940s. When presenting Adolph DeGrauwe his namesake award, board president Chris Hartowicz said, "there can be no better model for all the qualities we expect a Cavalier to be. 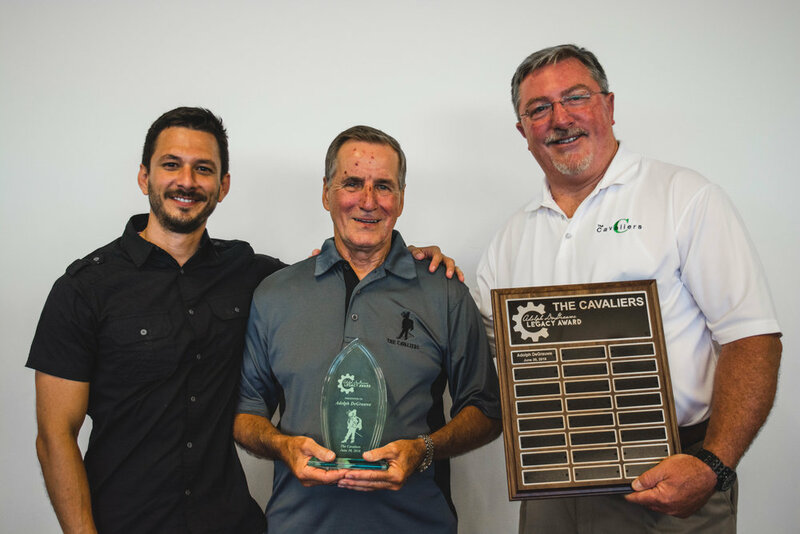 Adolph is a gentleman in every sense of the word, and his quiet dedication, leadership, humility, and clear vision for keeping us running as the 'Green Machine' serves as a lasting example for all generations of Cavaliers, especially those in the 2018 and future Cavalier corps." "As is shared by many inside of the organization, I am humbled to follow in his footsteps as we March On Through the Years," added Hartowicz. ADOLPH – THANK YOU FOR YOUR PASSION AND DEDICATION TO THE CAVALIERS!